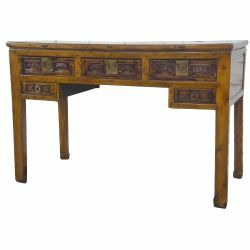 Authentic chinese and vietnamese furniture old are more coveted in our countries of Europe. These vietnamese and chinese furniture reflect the traditions and stories of their countries of origin. In ancient times the furniture of china and Vietnam has played an important role. These different chinese furniture, cabinets, married, safety deposit box wedding tables wedding were usually part of the dowry. A wide variety of wood species such as camphrier, the yellow cedar, the fir, the elm, the fruit, the cedar were used. In terms of decoration, the furniture were embellished with carved and painted motifs of animals, or floral motifs, and scenes that symbolize the justice, the righteousness or friendship. Antic chinese furniture There are 3 products. Cabinets chinese made their appearance in recent years of the Qing dynasty (1683-1895). These cabinets of marriage have furnished the houses of the wealthy classes-and medium-sized. The peculiarities of the furniture islands decoration with black ink and the patterns engraved or carved. Some cabinets of China's most luxurious feature inlays of mother-of-pearl. Low width, the offices lacquered or offices chinese varnishes easily find their place in a small room or an entry that you will care of the decoration with asian design. In China, all furniture with a bottom and a lid that can serve as the storage are called lockers. Elm or in camphrier, painted or drawn floral motifs, chinese boxes and chests tibetans were reserved for the storage of jewellery or were a component of the dowry of the bride, where some of the chests of married chinese increasingly rare to procure. The windows, the friezes and doors of ancient chinese in this category are from buildings in asia who have been destroyed to give way to modernity... Each room is renovated. Sometimes we are lucky, in this case the renovation is summary and you will be under the charm of a piece authentic which the experience will take you, depending on your travels, your readings, and your imagination. The concept of consoles, chinese has built the culture of chinese furniture as the period when the country began to open to the west. Their clean lines and aesthetic of clean furniture asian allows easy integration in a contemporary environment.